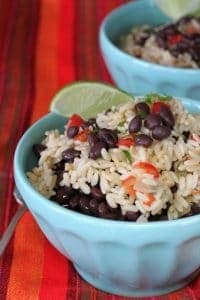 I fell for Gallo Pinto, this black beans and rice recipe, on a trip to Costa Rica. I’ve been smitten with Costa Rica food and their national dish (and treasure) ever since! We met in Costa Rica. 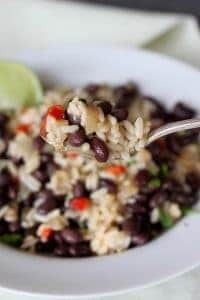 I fell for Gallo Pinto, the black beans and rice that is a national Costa Rican dish (and treasure). But it’s not just me. Beans are on the big stage. The United Nations declared that 2016 is the International Year of Pulses. Pulses are a group of 12 crops that includes dry beans, dry peas, chickpeas, and lentils. These hearty crops are high in protein, fiber, various vitamins, and provide amino acids. Not only good for us, but good for the Earth. The Global Pulse Confederation says that pulse crops are one of the most sustainable crops a farmer can grow. It takes just 43 gallons of water to produce one pound of pulses, compared with 216 for soybeans and 368 for peanuts. They also contribute to soil quality by fixing nitrogen in the soil. I’m all over a good deal and beans are good for the budget. A pound of dried black beans is less than $1.80. With some rice, peppers, onion and garlic, this is a wallet friendly meal. These little beans are also filled with health benefits. Beans are rich in protein, calcium and iron. If you’re looking for a meatless meal, look no farther. Their high protein content makes them a staple around the world. With 8 grams of fiber per half cup, they are also one high fiber food. We need between 25-35 grams of fiber per day, yet most of us maybe get half that. We could benefit from some bean therapy by eating more beans. men and women over 50 it is 30 and 21 grams per day, respectively, due to decreased food consumption. 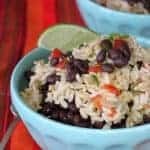 Black beans are one of the most antioxidant-rich foods around and when you combine them with rice, onions, peppers and garlic you have a satisyfing meal. 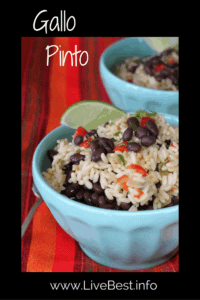 The Costa Ricans enjoy Gallo Pinto for breakfast, lunch and dinner. Sure I liked seeing sloth, toucans, crocodiles and volcanos, but who knew beans and rice would be my favorite memory? In fact, the theme of this post is based on The Recipe Redux challenge to create a healthy recipe from an unforgettable vacation meal. Food draws me on my travels. I love to learn about what is local to an area. That means visiting markets, grocery stores and farms. As a result, I bring home some tasty souvenirs. Dried beans need to be rehydrated before cooking, One way is to soak them for 6-8 hours before cooking. I simply put them in a pot and cover with water before I go to bed. Another option is to cover beans with water. Bring to a boil and boil for 2 minutes. Remove from heat and let stand for 1 hour. Drain and rinse. At this point they’re ready to cook. But if you’re short on time or just can’t wait, use 2-3 cans of black beans rather than dried ones for all the goodness in the time it takes to use a can opener. This dish gets better over time. So plan to cook once and eat two or three times! Economical, hearty and healthy, this plant-based dish is delicious. Place beans in large pot and cover with 6-8 cups water. Beans should have at least an inch of water over them. Cover and allow to soak for 6-8 hours or overnight. When ready to cook, drain and rinse beans. Return beans to pot and cover with 6 cups water and 1 teaspoons salt. Over medium heat, bring beans to a boil, reduce heat to low so beans cook at a simmer for 2 hours, or until softened. You want the beans to be cooked through, with a slight resistance when you bite one. Beans can overcook. When that happens the skins burst and they get mushy. Heat oil over medium heat in large skillet. Add onion. Cook 8-10 minutes until onion is soft and translucent. Stir in rice and cook for 2 minutes. Add red pepper and jalapeño, cook for 3-5 minutes, stirring occasionally. Add garlic and cook for 1 minute. Pour in broth. Season with salt and pepper. Bring mixture to a boil then reduce heat to low, Cover and cook 20-23 minutes until liquid is evaporated. Scoop beans from liquid and stir into rice. Squeeze lime wedge over just before serving. If you’re short on time or just can’t wait, use 2-3 cans of black beans rather than dried ones for all the delicious healthful goodness in the time it takes to use a can opener. See what my fellow Recipe Redux bloggers have brought home from their travels. What a great message, Sarah! Pleased I could evoke those emotions. There’s something unbeatable about beans and rice. This looks so delicious! Thanks, Courtney. I have to agree…they are!